New Labour scum seek to reverse the major achievement of the post-war Labour government. Simon Stevens, a former vice-president of the US health-care giant United Health and former health adviser to New Labour, became NHS chief executive this week. 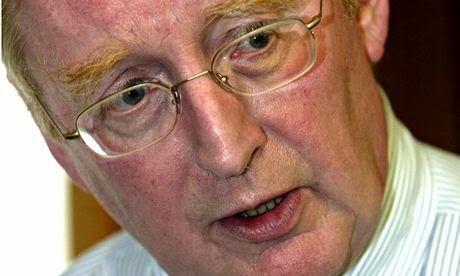 It is unlikely to have been a coincidence that former Blair Health Minister, Lord Warner, and the New Labour Reform think tank came out with proposals for NHS charges. The silence of Miliband and New Labour has been deafening. The NHS was created under the Attlee government under Aneurin Bevin, based on the principle that access was free at the point of delivery regardless of one’s means. 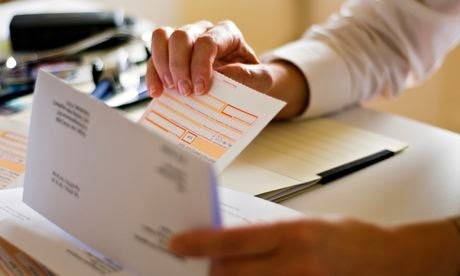 People paid for the NHS through general taxation not individual charges. 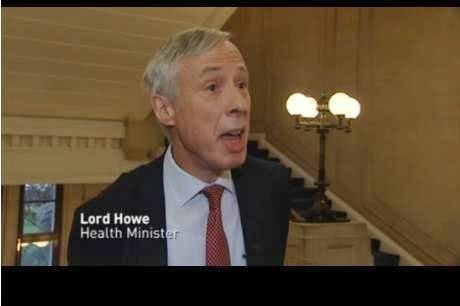 The proposal to make everyone pay for a doctor’s visit or a stay in hospital was, as is normal, accompanied by the usual scapegoating of migrants. For the past few months we have had a racist government campaign which suggests that migrants are to blame for the crisis in the NHS. 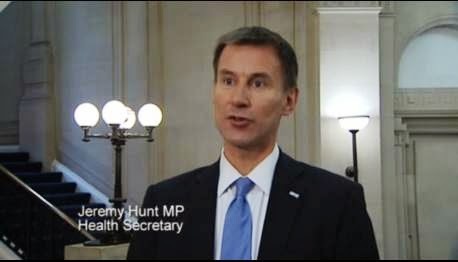 According to Jeremy Hunt they cost £2 billion a year. The only result of Jeremy Hunt's fiddling of the statistics is that some migrants will prefer not to seek medical treatment and hope to recover by themselves. Migrants will now pay for emergency care and A&E treatment. The public health threat is obvious. It is also an example of the inhumanity of modern capitalism. free but for how much longer? It is an example of a petty nationalist attitude that believes that British people never go on holiday or travel abroad. It goes without saying that we expect emergency treatment if we fall ill, without paying for it. But the government relies on racist scapegoating (it won’t affect European Union citizens or those in most of western Europe, with whom we have reciprocal arrangements), as a means to introduce the principle of charging. As it is the NHS is being used as another branch of the immigration service, itself preventing people seeking treatment. The NHS is or was the envy of the world. Unlike the United States, your ability to receive care doesn’t depend on the size of your purse. But to those like Simon Stevens, the NHS’s budget is ripe for cherry picking by those such as his former employer. New Labour and Miliband were the origin of many of these proposals. We cannot rely on these people to support any campaign to defend the NHS. New Labour has no principles which are not for sale to any private interest. The only way to stop the government and their Lib. Dem partners-in-crime in their tracks is a nation-wide campaign against charging for NHS treatment. If there is a crisis, then there should be massive investment in the NHS. The buzzword of these think thanks is that supporting the NHS is ‘unsustainable’. On that basis we should abolish the Army, the Monarchy and the banks. It is all about political choices. Cameron and Miliband will always have room for corporation and tax cuts. Bailing out the banks to the tune of billions of pounds is no problem as bankers come from the same political class. But to these people, the NHS is a waste of money. If the poor cannot afford private treatment then they should go without. The very idea of the NHS and ‘socialised medicine (which US Republicans and The Tea Party hate so much) is an affront to the ‘values’ of capitalism. What you get you should pay for. The NHS is based on the socialist idea that you contribute what you can and take what you need. It is not enough that 56% of people oppose charges and only 12% would pay for an appointment the next day. Multi national corporations aren’t concerned with public opinion. Only a determined campaign, that includes general strike action, will halt the campaign to privatise the NHS. 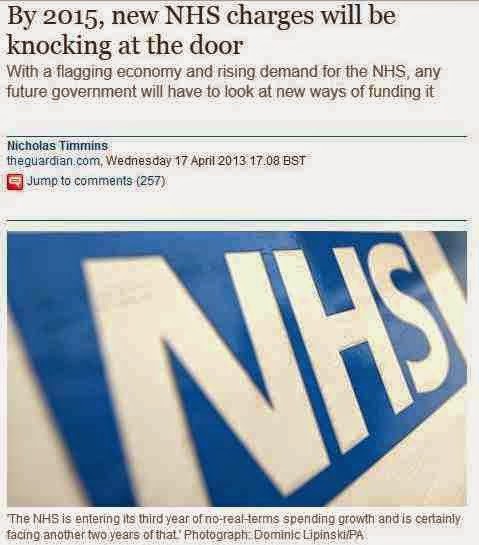 The rot started when Blair introduced private companies into the NHS to cherry pick services. He called it 'choice'. Next we had whole NHS services being handed over to private companies. The logical result of this is full-scale privatisation and charging. We will have only ourselves to blame if the one major gain left standing from the post-war settlement is destroyed.